June 2018: What we’ve been up to and what’s coming up. Last weekend, a number of the regiment headed to Pontefract Park again to take part in Wakefield Armed Forces Day. After the success of the event last year, we were very excited to be going back and setting up camp again. We thought it was about time to introduce you to the man at the top, William Cavendish, Marquess of Newcastle and take a look at the life and career of the man who’s regiment we make up. In Mrs Newcastle’s somewhat starry eyed biography of her husband, she mentions that his forces defeated a significant Parliamentarian force at Tankersley Moor which is between Sheffield and Barnsley. It is also mentioned in his patent for Marquess. Re-enactment at Wentworth Castle of the Battle of Tankersley, which Newcastle’s Regiment organised in July 2013. 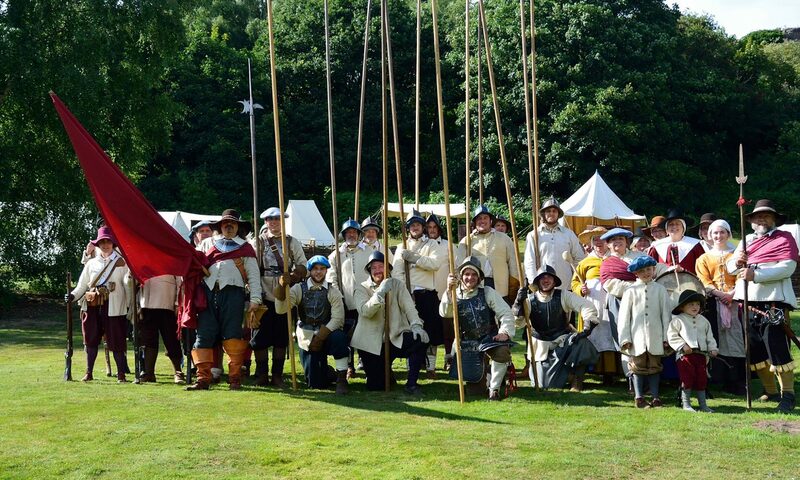 Introduction: Following his defeat at Wakefield, Newcastle determined to finish off the Parliament Forces (commanded by Lord Fairfax and his son, Sir Thomas Fairfax) once and for all. He gathered a force of about 7-8000 and marched for the Parliament strongholds of Leeds and Bradford. The Fairfaxes set out to try and catch Newcastle on the march and fight him on ground of their choosing (Adwalton Moor). This did not quite work as Fairfax found Newcastle ready for him. Fairfax was able though to get his troops in position. Histories of the Civil War are readily available which detail either military actions or the careers of individual officers. These can be referred to if you wish to find out more about William Cavendish, Marquess of Newcastle and/or the course of the war in the North. The aim of this section is to give a short overview of Newcastle’s own Foote Regiment, and some of the actions in which they were engaged. It is necessarily a ‘potted history’ as direct references to Newcastle’s are few and somewhat patchy, mainly due to the fact that history in the seventeenth century was seen either as one of individuals, or else one of events. We can surmise that the Regiment was involved in certain actions, even justify this with some arguments, but it remains that this is a somewhat suspect way of producing a history and thus must be used with great care.